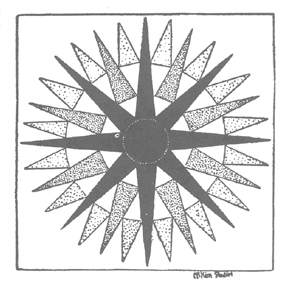 THERE are different versions of the Rising Sun, and the blocks of the one supplied here are to be appliqued on 18-inch white squares. We can furnish all materials for the thirteen complete applique blocks of this quilt ready cut in orange, gold, and yellow on white, using fine fast color quilt materials. These, if alternated with twelve 18-inch blocks of matching white (included in order) will make a 90-inch quilt, price, $4.00. 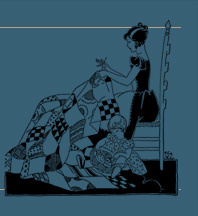 This makes a charming large pillow to finish round or square. One ready-cut block may be ordered as number 708A at 35c. Perforated quilting pattern exactly like the block, to quilt on the alternate plain blocks is No. 708P at 25c. All materials for the thirteen complete applique blocks of this quilt ready cut in orange and two yellows on white in fine fast color quilt materials is supplied, together with twelve 18-inch blocks of matching white and will make a 90-inch quilt.